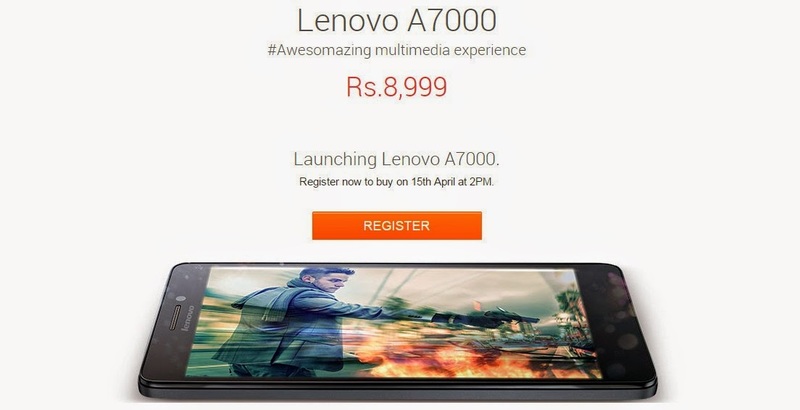 We reported last week Lenovo A7000 will be officially launched in India on April 7. True to its promise, the Chinese company introduced its affordable smartphone in the country and confirmed once again that it will be available exclusively through Flipkart. The Indian major retailer is supposed to offer the smartphone through a flash sale system, which is likely to frustrate many Lenovo fans. The flash sale system is meant to cover up the fact that Lenovo was not capable to deliver enough A7000 units for customers in India. It's also a way to test demand for a product that you're not sure it will be popular. Lenovo is likely to order more A7000 units if the smartphone will sell well in India. Speaking of which, Lenovo A7000 will be available for purchase at Flipkart for only Rs 9,000, which is about $145 or €135. The first flash sale for the A7000 will take place on April 15 at 2PM. Obviously, you will have to register if you want to be able to place an order for the Lenovo A7000. Flipkart is expected to have more Lenovo A7000 flash sales if the first one proves that the smartphone is popular among Android fans. Lenovo A7000 is an affordable smartphone that comes with Android 5.0 Lollipop operating system out of the box. It also offers the Dolby Atmos sound technology, which is supposed to make it stand out. Other highlights of the A7000 include a decent 5.5-inch HD (720p) capacitive touchscreen display, LTE and dual-SIM support, as well as 8GB of internal memory. The smartphone is equipped with an octa-core MediaTek MT6752 processor clocked at 1.7GHz, a Mali-T760MP2 graphics processing unit and 2GB of RAM. It's also worth mentioning Lenovo A7000 features an 8-megapixel camera on the back, a 5-megapixel camera in the front and 2,900 mAh battery.